Despite the fact that Russia's currency has plummeted over the last few month, the Central Bank has stopped conducting large-scale currency interventions and selling U.S. dollars to stabilize the exchange rate. Last week, the Russian ruble fell to its lowest ever rate against the U.S. dollar. However, despite incredible pressure on the national currency, the Central Bank is not selling U.S. dollars. The regulator had previously performed currency interventions as a tool to stabilize the exchange rate. According to Russian business newspaper Vedomosti’s sources, the Central Bank could sell “several tens of millions of dollars” on the market, but as sources from the newspaper RBC Daily note, the regulator has not been participating in trades at all. “Data about Central Bank currency interventions are published at a delay because trade is based on calculations for tomorrow,” Mikhail Khromov, a research fellow at the Russian Academy of the National Economy and Public Administration’s Institute for Applied Economic Research, told RIR. As a comparison, he said that in March 2014, when the political situation in Crimea was at its most intense, the Central Bank performed $11 billion in interventions in one day. According to experts, this is the Russian government’s first attempt at checking its officially announced transition to a floating exchange rate for the ruble. The last transactions aimed at supporting the ruble occurred at the beginning of May 2014, according to Anton Soroko, an analyst at investment holding Finam. Afterwards, the regulator had to sell rubles, but not for a substantial period. “In recent months, the trend for a weakening ruble has lasted roughly as long as it did at the beginning of the year, but as yet there has been no Central Bank intervention. I don’t think things will come to interventions like the ones seen in March in terms of volume,” said Soroko. Market players say that the attack on the ruble is at its most acute since the spring of 2014. However, this time it has provoked reports by Bloomberg that Russia is planning to implement cross-border capital controls. The Central Bank later denied the report. “It’s too early to say that the attack on the ruble has been repelled,” said Alexei Kozlov, chief analyst at UFS IC, who added that market players understand that persistently declining oil prices are putting pressure on the ruble, and this is provoking them to make plays on weakening the Russian currency. “The Russian economy’s recent weak dynamic, the instability of the ruble itself, and the fact that the Bank of Russia has been forced to tighten monetary policy do not add any appeal to investment in Russia, which facilitates capital outflow,” Kozlov said. Many Russian companies – exporters, to be precise – are winning big from the falling ruble. The press service of Rusal, one of the largest aluminum producers in the world, told RIR that the company has increased the outlook on its financial results because of the devaluation. Against the backdrop of growth in aluminum prices in the first half of the year, in the second quarter Rusal was able to generate profit for the first time in over a year. The Russian company is also counting on turning a profit in the third and fourth quarters. Meanwhile, the Magnitogorsk Iron and Steel Works (MMK), the largest metallurgical complex in Russia, which is oriented towards the domestic market (it accounts for 82.2 percent of the company’s total shipments), is still benefitting from the falling ruble. “Only 50 percent of MMK’s costs are denominated in rubles. So now that the ruble is devaluing against the U.S. dollar, we are reducing ruble spending in dollar terms,” a spokesperson for MMK told RIR. According to the company’s calculations, a 2.5 percent decline in the ruble would spell a 0.9 increase in EBITDA (earnings before interest, taxes, depreciation, and amortization), while a 15 percent decline in the ruble would mean a 4.9 percent rise in EBITDA. For industries focused exclusively on the Russian market, the effect of a weakened ruble is not as clear, as Alexander Kostikov, a spokesman for the Cherkizovo Group, one of the leaders on the Russian livestock market, told RIR. “Imports are getting more expensive, and accordingly, the consumer prefers domestic goods. Our company is in the ruble zone – we don’t have foreign currency loans, and therefore devaluation doesn’t hit us that hard,” said Kostikov. However, he added that one drawback is that some raw materials, particularly veterinary medicines, are purchased abroad. 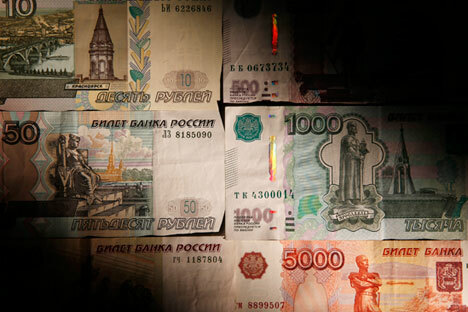 Financial analysts, however, are being much more cautious in their assessments of the situation: Anton Soroko of Finam believes it is worth waiting until the political pressure on the ruble has eased up; then the exchange rate will be smoother and more predictable. “It’s still hard to say that the Central Bank’s new step towards a floating exchange rate has been a shining success. The ruble is still relatively volatile, and the per-annum decline in the domestic currency’s purchasing power seems too strong,” he said.